my life as a brownie. : religion and art save environments. I read an interesting passage the other day on BBC. 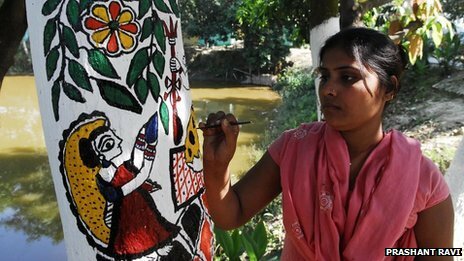 It was of men and women painting tree trunks in Bihar, India of Hindu gods and goddesses like Krishna, Radha, Saraswati and Durga. The artists hope the drawings would avert religious fearing Indians from cutting the trees. The reason why this has been effective so far is most people in India, especially in villages are highly religious and they fear cutting down trees will give them bad luck. My public relations knowledge came into effect when reading this article. - Bihar, India, religious men and women aged 20-65. - Message has been sent to various publics to NOT cut down trees in fear of bad luck. Beware or Hindu gods and goddesses will come after you. - Save the environment. India is growing more and more every minute and second of the day. Let's maintain the living life we have and deter from destroying it. Religion and Art can save the environment!